"Robes and Jewels of Titled American Women to Be Worn at the Coronation of King George"
London, March 23 -- The robes and coronets to be worn by peeresses at the coronation differ widely. Full evening dress will be the order of the day for all, however, and the display of jewels will be one of the finest ever seen. Some of the peeresses who have small tiaras will wear them, for on entering the abbey their heads will be adorned simply with the lace veils which hang down over the robes in the back and are fastened to the hair with jeweled ornaments. The coronets are not adjusted until the king and queen have been crowned, when the peers and peeresses place their coronets on their heads. There are a great many more peeresses now than when King Edward was crowned, and they will be seated in the abbey according to their rank. The duchesses take precedence, of course, and their robes and coronets are the most elaborate. Four duchesses are to hold the canopy over Queen Mary's head , and the others, including the Duchesses of Marlborough , Manchester , and Roxburghe , will have seats near the royal family. They will all wear elaborate evening gowns, jewel studded. Their coronets will have the ducal strawberry leaves. Their robes will be bordered with ermine bands five inches wide, while their short capes, which hang just between the shoulders, will have four rows of black spots on the white ground. These distinctions mark them as duchesses. The marchionesses, who come next in rank, will have but three and a half rows of spots on their capes and only a four-inch band of ermine, while their coronets will be simpler and bear a different design. The Marchioness of Dufferin and Ava  will be the only American represented in this rank. The countesses have still another design on their coronets, while their capes have but three rows of spots and their robes have only a three-inch band of ermine. The American countesses are numerous, among them being Ladies Granard , Essex , Sussex , and Ancaster . The viscountesses have two and a half rows of spots and a three-inch band of fur, while the baronets' wives have only two rows of spots on their capes and a two-inch band of fur. There are many Americans in this rank: Ladies Decies , Acheson , Maidstone , Paget , Abinger , Barrymore , Newborough , Leith , and Innes-Ker  among others. The knights' wives do not properly rank as peeresses, but many of them will go into the abbey, either because their husbands are members of parliament or because they have been specially invited. They will wear full evening dress or reception gowns. Ladies Parker , Cunard , Henry , and Evans  are some of the American women in this list. Although the distinctions of rank must be conformed to as regards details of actual state costume, there is no rule regarding jewels, so every woman may wear all her precious stones of greatest value. Queen Alexandra really possesses the finest jewelry in the kingdom, but as she has decided not to appear at the coronation, Queen Mary will have the finest display of gems. She will wear nothing but rubies and diamonds. The Duchesses of Buccleuch  and Westminster  have the most gorgeous jewels among women of their rank. The Duchess of Buccleuch will wear the Buccleuch sapphires, while the Duchess of Westminster will have as a pendant the wonderful Nesca diamond , one of the treasures of the Grosvenor family. The Duchess of Marlborough, who seldom uses much jewelry, will wear the famous Vanderbilt pearls. 1. The "Canopy Duchesses" at the 1911 coronation were the Duchesses of Sutherland, Montrose, Hamilton, and Portland. 2. Consuelo Spencer-Churchill, Duchess of Marlborough (1877-1964), née Consuelo Vanderbilt of New York. She was the first wife of the 9th Duke of Marlborough. The couple had been separated since 1906; they divorced in 1921. She later married Jacques Balsan. 3. Helena Montagu, Duchess of Manchester (1878-1971), née Helena Zimmerman of Cincinnati. She was the first wife of the 9th Duke of Manchester. They divorced in 1931. She later married the 10th Earl of Kintore. 4. May Innes-Ker, Duchess of Roxburghe (1878-1937), née May Goelet of New York. She was married to the 8th Duke of Roxburghe. 5. Florence Hamilton-Temple-Blackwood, Marchioness of Dufferin and Ava (1866-1925), née Florence Davis of New York. She was married to the 2nd Marquess of Dufferin and Ava. He died in 1918, and she subsequently married the 4th Earl Howe. 6. Beatrice Forbes, Countess of Granard (1883-1972), née Beatrice Mills of New York. She was married to the 8th Earl of Granard. 7. Adele Capell, Countess of Essex (1867-1922), née Adele Grant of New York. After breaking an engagement to the 2nd Earl Cairns, she married the 7th Earl of Essex in 1893. 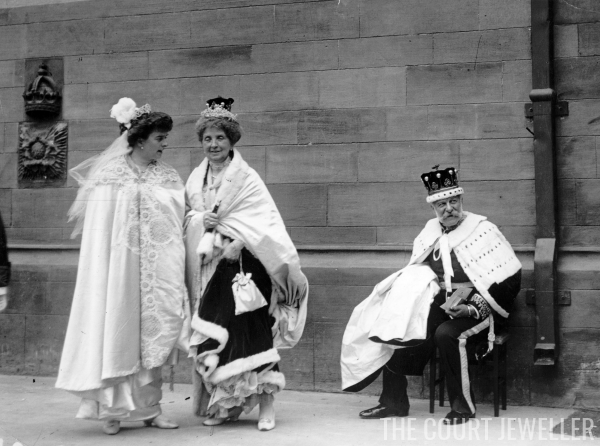 Her Cartier-made diamond tiara was worn by Clementine Churchill at the 1953 coronation; it was also later worn as a bridal tiara by Margarita of Romania. 8. This appears to have been an error on the part of the article's writer. In 1911, the Sussex earldom was a subsidiary title of Prince Arthur, Duke of Connaught and Strathearn, one of the sons of Queen Victoria and Prince Albert. His wife, Princess Louise Margaret of Prussia, was certainly not an American peeress. I think the writer may actually have been referring to Daisy Howard, Countess of Suffolk (1879-1968), née Daisy Leiter of Washington, D.C. She was married to the 19th Earl of Suffolk. Her late sister, Mary, was the first wife of Lord Curzon. 9. Eloise Heathcote-Drummond-Willoughby, Countess of Ancaster (1882-1953), née Eloise Breese of New York. She was married to the 1st Earl of Ancaster. Her sister, Anne, was married to Lord Alastair Innes-Ker. 10. Elizabeth Beresford, Lady Decies (1868-1944), née Elizabeth Wharton Drexel of Philadelphia. Her third husband was the 5th Baron Decies; she had previously been married to New York socialite Harry Lehr. She published two memoirs of life in the Gilded Age. 11. Mildred Acheson, Viscountess Acheson (1888-1965), née Mildred Carter of Baltimore. She was married to Viscount Acheson, who became the 5th Earl of Gosford in 1922. The couple divorced in 1928, and he married another American, Beatrice Claflin of New York, who had previously been married to Robert Breese (brother of Lady Ancaster and Lady Alastair Innes-Ker). 12. Margaretta Finch-Hatton, Viscountess Maidstone (1885-1952), née Margaretta Drexel of Philadelphia. She was married to Viscount Maidstone, who became the 14th Earl of Winchilsea and 9th Earl of Nottingham in 1927. 13. Lady Arthur Paget (1853-1919), née Minnie Stevens of New York. She was married to Col. Sir Arthur Paget. 14. Helen, Lady Abinger (1845-1915), née Helen Magruder of Virginia and Montreal. She was the widow of the 3rd Baron Abinger; their son, James, became the 4th Baron Abinger. 15. Elizabeth Smith-Barry, Lady Barrymore (1848-1930), née Elizabeth Wadsworth. She was the second wife of the 1st Baron Barrymore. She had also previously been married to Arthur Post; their daughter, Helen, later married the 8th Earl of St. Germans. 16. Grace Wynn, Lady Newborough (1877-1939), née Grace Bruce Carr of Louisville. She married the 4th Baron Newborough after meeting him in Egypt. 17. Marie Louise Forbes-Leith, Lady Leith of Fyvie (1848-1930), née Marie Louise January of St. Louis. She was married to the 1st (and only) Baron Leith of Fyvie. 18. Lady Alastair Innes-Ker (1885-1959), née Anne Breese of New York. She was married to Lord Alastair Innes-Ker, a younger brother of the 8th Duke of Roxburghe. Her sister was the Countess of Ancaster. 19. Lady Parker (1864-1925), née Amy Van Tine of New York. She was married to Canadian novelist and British MP Sir Gilbert Parker, who was created a baronet in 1915. 20. Lady Cunard (1872-1948), née Maud Burke of New York. She was married Sir Bache Cunard, 3rd Bt. ; they separated in 1911. After his death in 1925, Maud adopted the name "Emerald" and became a prominent (and often controversial) social hostess. One of her frequent dinner guests in the 1930s was Wallis Simpson. Her daughter, Nancy, would become an important writer and activist. 21. Lady Henry (1872-1927), née Julia Lewisohn of New York. Her Australian-born husband, Sir Charles Henry, 1st Bt., received his baronetcy in the 1911 New Years honors list. He was an MP for Shropshire. 22. Marie, Lady Evans (1849-1920), née Marie Stevens of New York. She was the widow of Sir Francis Evans, 1st Bt., who was a civil engineer and politician. 23. Louisa Montagu Douglas Scott, Duchess of Buccleuch (1836-1912), née Lady Louisa Hamilton. She was a daughter of the 1st Duke of Abercorn, a granddaughter of the 6th Duke of Bedford, and the wife of the 6th Duke of Buccleuch and 8th Duke of Queensberry. She was the grandmother of Princess Alice, Duchess of Gloucester and a great-great-grandmother of Sarah, Duchess of York. 24. 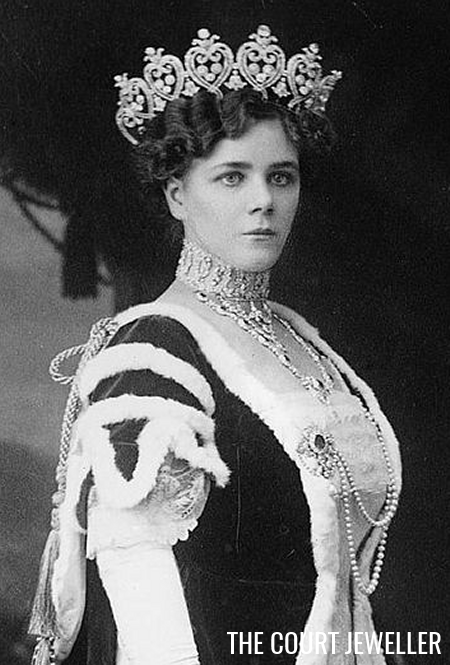 Constance Grosvenor, Duchess of Westminster (1877-1970), née Constance Cornwallis-West. Known as Shelagh, her first husband was the 2nd Duke of Westminster. They divorced in 1919, and she married her private secretary, Captain John Fitzpatrick Lewis. 25. The Nassak Diamond is a blue-white diamond of more than 43 carats that was mined in India in the 15th century. It was acquired by the Grosvenor family in 1837, and it was set in the handle of the dress sword owned by the 1st Marquess of Westminster. The Grosvenors disposed of the diamond in the early 20th century, and it eventually made its way into the hands of Harry Winston, who recut the gem. It was eventually purchased by William Bateman Leeds, Jr., who was the only son of Princess Christopher of Greece and Denmark. The diamond is reportedly owned today by the Saudi royal family.